So there are a number of Big Chill cafes in Delhi. There is one in Kailash Colony, two in Khan Market, one in Select City Walk Saket. I think I covered them all. 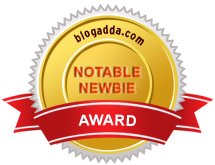 Back to the interesting twist. 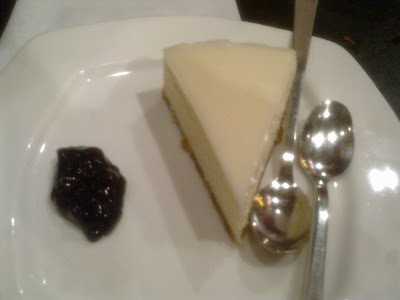 The cheesecake I did end up reviewing is from the bigger, fuller Big Chill in Khan Market. The cheesecake is yum. Without a doubt. Its cheesy, especially love the side of fresh blueberries that they serve it with. The base is perfect. What I did have an issue with however, is that the cake is too soft. Its almost sheer cream. So you see how inconsistency within a restaurant doesn't really work wonders for it. 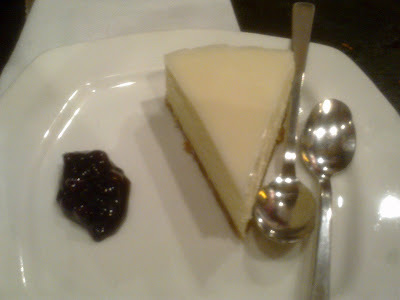 Some other places to try cheesecake in Delhi: Mrs. Kaurs in Khan-also for crepes and waffles, Cafe Oz has a decent cheesecake..slightly sour cheese though..if that works for you. Cheese cake for me too!